As I brought up Blogger on my screen to write this post, my mind went blank for a few seconds. I forgot what I was to write about. What dish had I photographed? What images had I edited? What exactly did we have for dinner the other night? You see, I have been having many sleepless nights. I'm certainly not used to it. Maryam started sleeping through the night when she was a mere two months. I never knew what it was like to be up every few hours to nurse, change diapers, burp, rinse and repeat. Hassan is different though. He certainly wakes more often and it's already taking its toll on me. I just haven't had the time to test recipes as I did previously and baking has taken a back seat. Nor for long though as I have had interesting flavour combinations I've been brainstorming in those late night feeding sessions. Pistachio and chocolate doughnuts, date and nut tea cakes, baklava ice cream sandwich anyone? For now though, I hope I can entice you with our everyday meals. Like this quick stir fry. 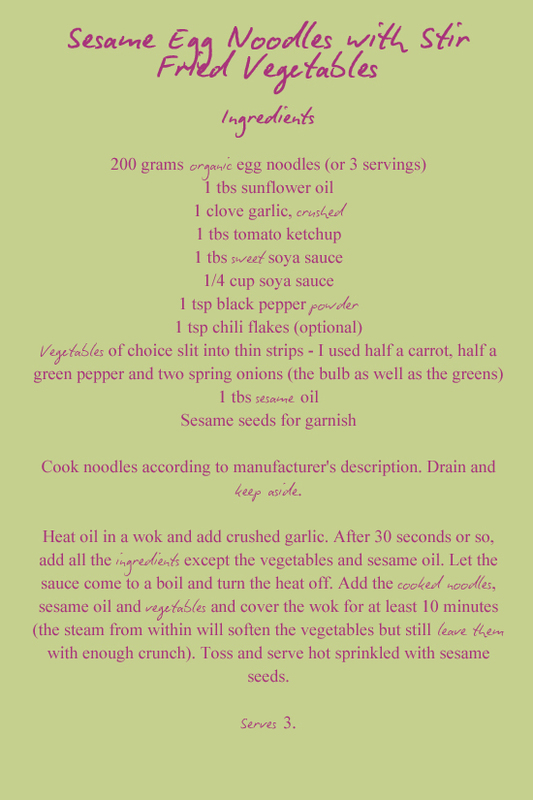 Organic egg noodles tossed in sesame oil and whatever vegetables you have on the side. Ready in less than ten minutes and eaten even faster. The perfect meal to prepare when time and energy isn't on your side. As I quickly whipped this meal in the kitchen, Maryam made her own version of 'loodles' with playdough. We then stole a few quiet moments to have this simple lunch together. It was good- with plenty of crunch left in the vegetables. We sucked up the 'loodles' like vacuums. I'm hoping to find some time this week to bring some of those baking ideas I've been dreaming about to reality this week. Soon I hope. Cook noodles according to manufacturer's description. Drain and keep aside. Heat oil in a wok and add crushed garlic. 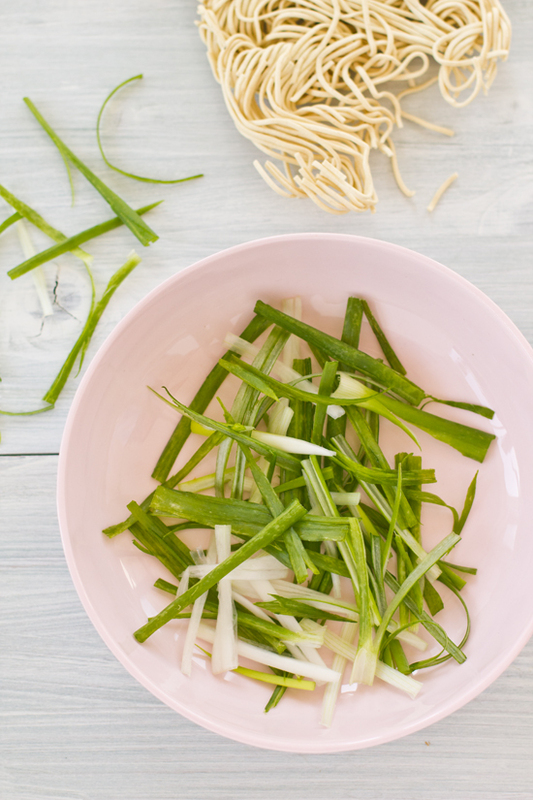 After 30 seconds or so, add all the ingredients except the vegetables and sesame oil. Let the sauce come to a boil and turn the heat off. 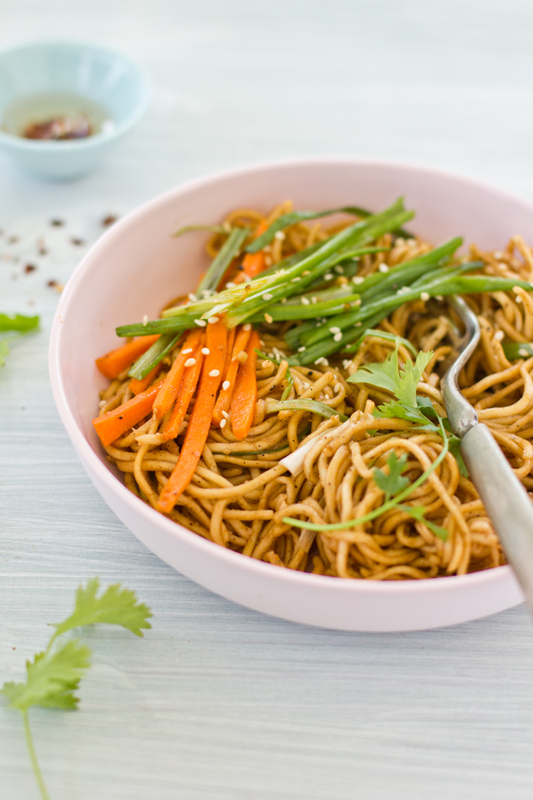 Add the cooked noodles, sesame oil and vegetables and cover the wok for at least 10 minutes (the steam from within will soften the vegetables but still leave them with enough crunch). Toss and serve hot sprinkled with sesame seeds. Really delicious recipe, fast and easy... Yumm. Wonderful recipe! And kudos to you for having a new baby and still managing not only to cook, but photograph and write a blog post. I swear, the first six months of my son's life are just a blur of late night feedings and early mornings with my daughter. When I really started to feel bogged down, I would just remind myself, "This, too shall pass." In the meanwhile, you would never know from your food/recipes/photos that you were juggling a new baby at home! 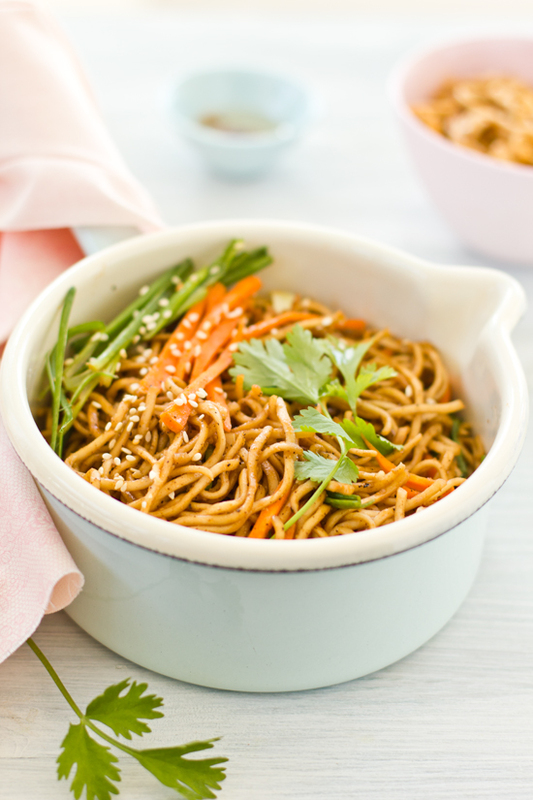 A delicious noodle dish! That recipe is lovely and wonderfully simple. I love those flavors. Congrats Sukaina for the nomination! You deserved it! Wow!! You're a rockstar!! The first six months for me were a whirlwind. We ate a lot of soups, I was in a daze due to lack of sleep, and blogging was the LAST thing on my mind. Kudos to you, and a lovely recipe to boot! I don't know how you do it Sukaina, I don't even have kids and at times I don't find the time to get things done!! Sukaina, this is really a nice looking stir-fried noodles! The noodles look so tasty. Congratulations on your nomination Sukaina, a very well deserved one! This looks fantastic - subtle, elegant and delicious :) Very well done, I would love a bowl! Congratulations! I'm a big fan of your photography! I clicked the link trying to vote for you but don't see the button. Hm...is it I have to register to cast my vote? Please let me know. Congratulations on the nomination!! You deserve it as your images are always stunning. 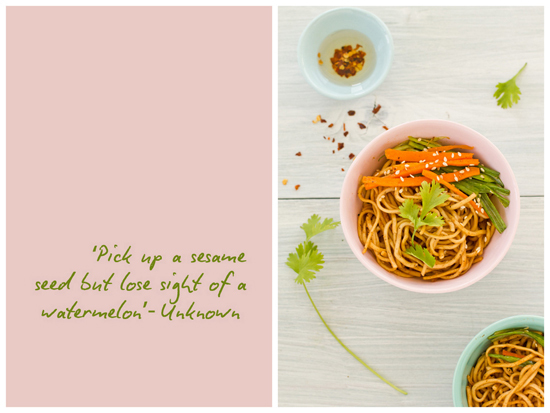 I love the look of your sesame egg noodles, they look so delicious. I just amazed at how you do it all, no need to make apologies for this wonderful recipe which I'd happily slurp down any day of the week! Congratulations on the nomination! 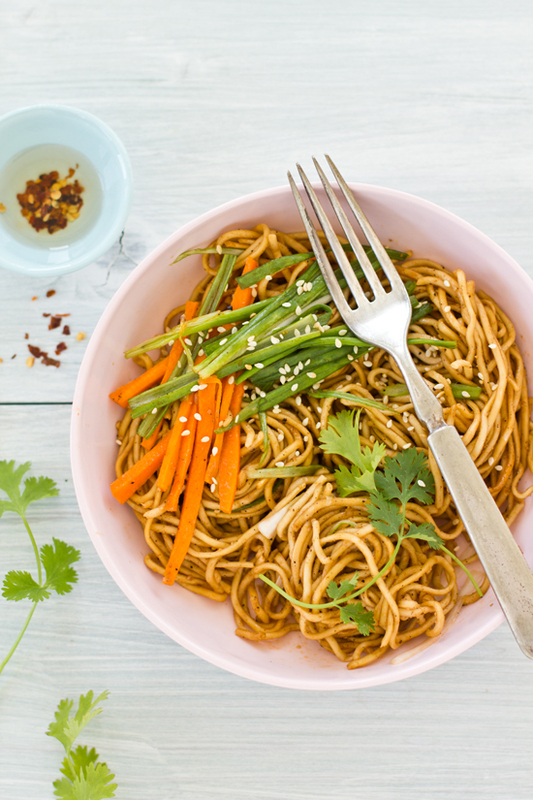 The noodles are incredible - I'd eat it any day! Thanks all for the votes and the encouragement re- late nights. I'm hoping it will pass soon. Amy- yes you need to register on The Kitchn's site to vote. Once you have logged in, you can just press the vote button next to the blog's name. HTH. Congratulations! You have really awesome clicks! The recipes are interesting too. Thanks for sharing! My husband has a thing for egg noodles. A thing which is very gravely embarrassing. I think he prefers noodles over my cooking. Its that bad. I'll make sure he doesn't see this else the spinach feta rolls I have made today will go for a toss. Forget not being able to make elaborate meals or test recipes.. Hats off to you! for whatever you are posting, your everyday meals be it..even with a small baby to take care of.. I love those strong colours against the pastel background, a visual feast! What a lovely blog!! I really like it! I'm following now! Ciao ciao! 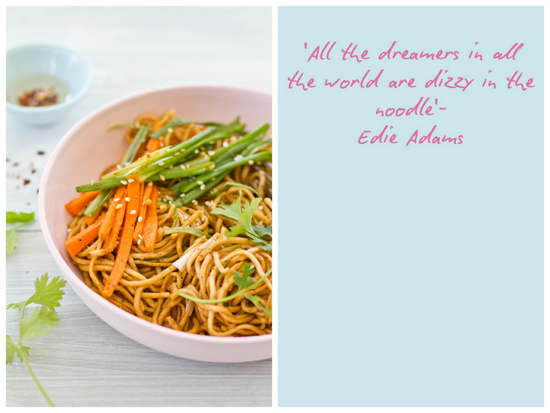 I never tire of noodles and these look so lovely and vibrant! I love this dish. Since I'm trying to loose weight (it is getting closer to summer, right?) I'm looking for easy and healthy recipes and this looks like a perfect one! Bookmarked! Can't blame your memory. A tiny baby, and a fairy and you are still cooking, taking photographs and blogging! one amazing lady! This post and the fresh photographs spell spring for me.. lovely simple meal. Thereby, exploit making juice in addition the fantastic configurations not wearing running shoes provide you with. A person's graphical user interface inside the HP3A is connected to combine of you see, the cpanel, as well as with being unfaithful pulls, together with the pink Steered projector screen at the base of the problem concerning the front one within vita mixer. Their Blendtec Just fine House kind products and solutions supply from the pressure and durability using financial call, even so are more appealing used for the your home. Do you want to want to use it to blend, join furthermore blend cozy food items comparable the berries so broth?